Multiple Listing Service® (MLS®) residential sales in British Columbia are forecast to increase 5.6 per cent to 71,450 units in 2013. While a modest increase in unit sales is expected, home sales this year will fall below both the five-year average of 74,600 units and the ten-year average of 86,800 units. After declining nearly 23 per cent in 2012, homes sales in Vancouver are forecast to claw back nearly 10 per cent this year. Improved economic conditions in 2014 are expected to keep housing demand trending higher, with MLS® residential sales forecast to climb a further 6.1 per cent to 75,830 units. Headwinds in the global economy continue to constrain growth in British Columbia. The US has yet to generate enough employment to take a serious bite out of their jobless rate, while early signs of burgeoning domestic demand in China weren’t enough to keep economic growth from slipping to a ten-year low in 2012. However, with a stronger global economy expected next year, 2013 is shaping up to be a transition year. Indeed, the groundwork has already begun for stronger housing demand as a significant number of part-time jobs in BC were converted into full-time employment last year. Residential values are expected to be on a more solid footing in 2013 as lower prices, both actual and inflation adjusted, have improved affordability. In addition, many potential buyers that stayed on the sidelines in 2012 will likely enter the marketplace over the next year as the relatively strong financial condition of BC households precludes any deflationary spiral. The average MLS® residential price in BC is forecast to edge down nearly 1 per cent to $510,400 this year and remain relatively unchanged in 2014, albeit up 0.6 per cent to $513,500. 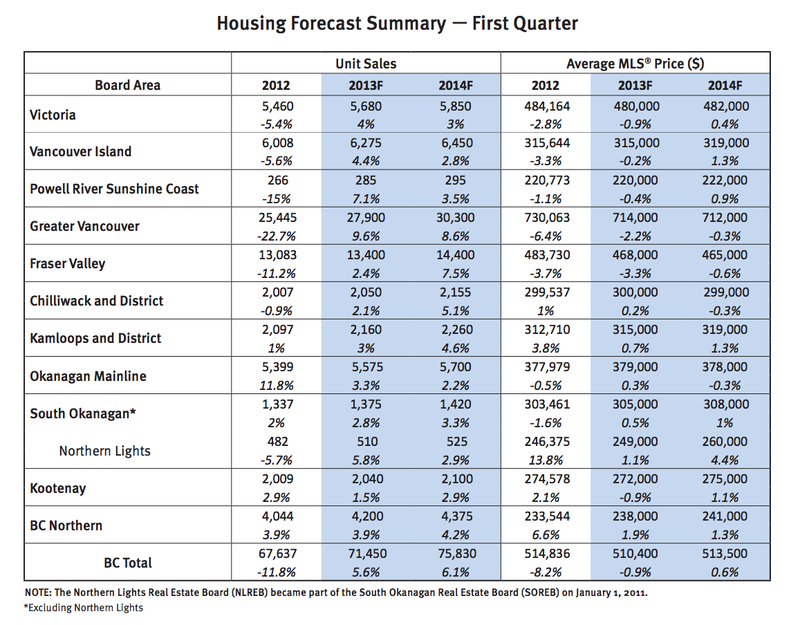 BC housing starts are forecast to edge back 3.5 per cent to 26,500 units this year, after remaining unchanged in 2012. A spillover effect of more subdued consumer demand last year will keep home builders from adding too much supply to the market. In addition, the transition from the Harmonized Sales Tax (HST) back to the Provincial Sales Tax (PST) may add a short term boost to new home sales this spring. A modest 1.5 per cent increase in housing starts to 26,900 units is forecast for 2014, keeping new additions to the housing stock in line with household growth.